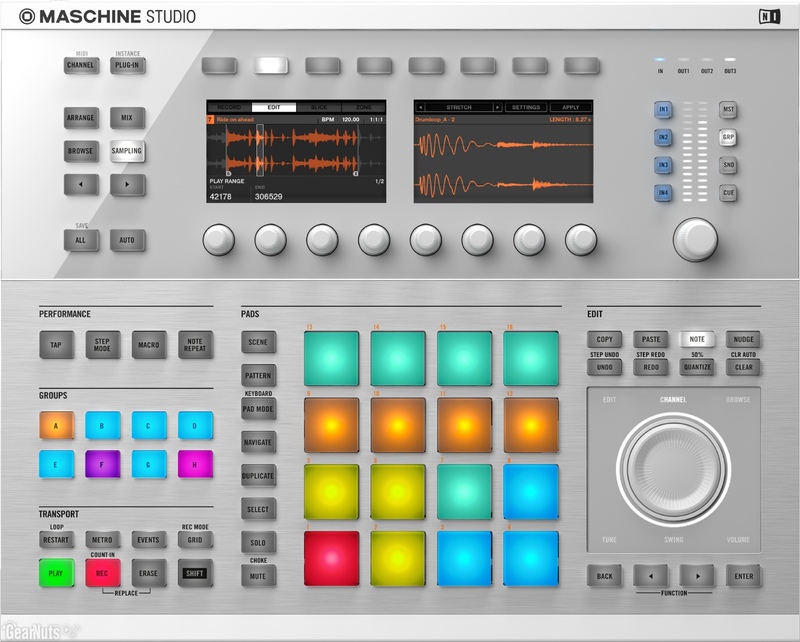 Learn the Maschine STUDIO, OS 2.7.10, from Native Instruments, with OS ver. 2.7.10, with these 3 DVDs and over 4.5 hours of lessons on every feature on the software and the hardware. We cover the Display, the Transport controls, all buttons, and knobs, Volume, Tempo and more. You'll learn how to do it on the Hardware and the software with our step by step approach. We'll teach you each section in the software from the Browser where we can load any Project, Group, Kits, Instruments, samples, to the Arranger Section where we can setup the sections to our song movie score, background music, etc. You'll learn the Control Area where we can add fxs to samples, sounds, groups, and the master, you'll also use ADSR apply LFO, control levels like volume, and velocity, assign parameters to knobs on the hardware and software and much more. The Pattern Editor where you can build your sequence's for each group like Drums, Basslines, Keyboards, for a Intro, a Verse, a Chorus, a Bridge etc, and how to use MIDI and each section of the Pattern editor for your production. Next the Arranger is for putting the Verse, the Chorus, the Bridge, in a sequence to get the right length for a song or musical passage and the best way to apply these lessons for editing these sequences, which includes MIDI as well. We teach you several ways to sample and to map samples on your Maschine and how to read and load AKAI MPC program files, how to load Reason .rex files, and any wav samples, how to save and load your Projects, Groups, Kits and samples. all these lessons will help you understand how to use your Native Instruments MASCHINE STUDIO to do anything you think of. See our Preview Videos below. MASCHINE unlocks MASCHINE STUDIO's touch-sensitive knobs. For example, when browsing, touching a knob automatically takes you to the tag cloud on the hardware display. Depending on which control knob you touch, you'll see all available options and functions in a pop-up list. For instance, routing options for sounds and groups. Absolutely no menu diving - a turbocharged workflow. MASCHINE extends Keyboard Mode with a new scale and chord engine - fully integrated into the MASCHINE workflow. Simply select your scale and start playing melodies on MASCHINE's 16 ultra-sensitive pads that are always in key. Engage Chord Mode and play chords directly into your compositions. MASCHINE extends Note Repeat into a fully-functional arpeggiator. Play any number of notes and let MASCHINE turn them into a melodic pattern. Use the arpeggiator in combination with Scale and Chord Modes and get polyphonic performances from just one key - always in tune. What's more, the output of the arpeggiator is recorded into the Pattern Editor - perfect for post-performance editing. MASCHINE gives you full keyboard functionality within the MASCHINE environment. Press browse on your KOMPLETE KONTROL keyboard and the KOMPLETE Browser pops up on your computer screen, letting you select and load a sound directly into a sound slot in MASCHINE. Watch scales, chords, and arpeggios light up across KOMPLETE KONTROL's Light Guide, see the color of your sounds in MASCHINE directly on the keyboards, and get perfectly-mapped parameters instantly with Native Map.